The IrDA (Infra-Red Data Association) standard is wireless replacement for traditional wired connections between computing devices and peripherals. It uses an infra-red LED and photo-diode to transmit information at up to 4Mbps over one metre. 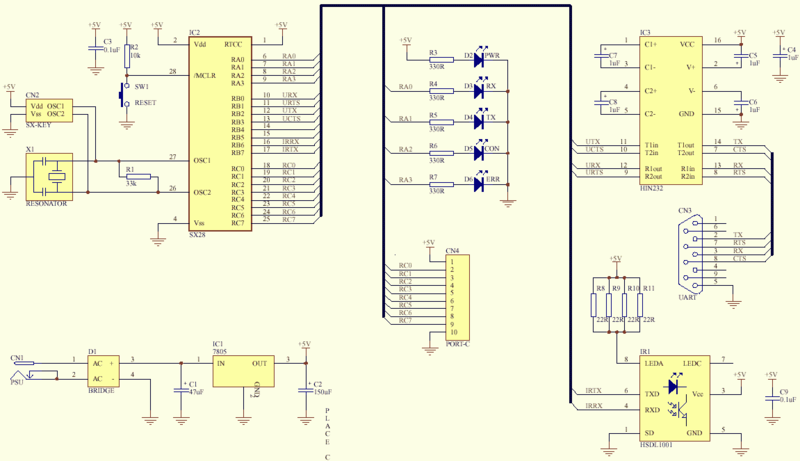 Ubicoms' implementation of this reliable protocol on a SX microcontroller is achieved by relying on the application's ability to re-send data upon request rather than the traditional use of large data buffers. The implementation communicates at up to 115.2kbps and makes use of the SX's high clock speed to shape the IrDA pulses without external hardware. It uses two virtual peripheral UARTs: one for the IrDA port and one for a debugging serial port. All documentation on this site should be read in conjunction with the IrDA Specification, IrDA Lite Specification and IrComm available from http://www.irda.org.